In 1958 a remarkable technique for expanding autografts was described by Mr. Cicero Parker Meek from the University of South Carolina Aiken (USCA), USA. With a MEEK-WALL dermatome, postage stamp autografts were obtained and expanded using double pleated gauzes. In this way a regular distribution of autograft islands was achieved with a nine fold expansion. This technique however required too much skill and it became eclipsed by the introduction of mesh skin grafts (Tanner et al., 1964). 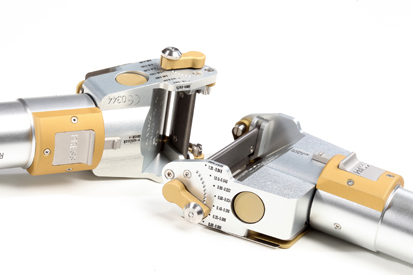 Eventually production of the MEEK-WALL dermatome and gauzes was discontinued. In cooperation with surgeons of the burn centre of the Red Cross Hospital Beverwijk, The Netherlands, Humeca re-designed and modernized the MEEK technique. Imperfections of the original method were overcome and the pre-folded gauzes are now manufactured with expansion ratios 1:3, 1:4, 1:6 and 1:9. The clinical results with this modified MEEK technique are excellent: graft take is reported to be superior to other grafting methods, even in problematic zones and even in case of qualitatively inferior wound beds. Only very small donor sites are required. Any small piece of patients skin can be used. The graft islands are close together in a regular pattern, resulting in fast epithelialization. As the autograft islands are not mutually connected, failure of a few islands does not necessarily affect the overall graft take. The method is a simple technique to achieve a regular distribution of postage stamp grafts, correctly orientated to the wound surface. At operation wounds to be grafted are excised down to the underlying fascia and haemostasis is secured. 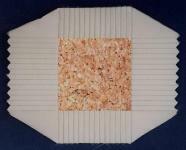 A square piece of cork measuring 42 x 42 mm with thickness 2 mm is covered with a split skin autograft, dermal side down. Smaller graft remnants are also suitable by placing them on the cork plate like a “puzzle”. The cork, covered with graft, is then placed in a cutting machine. 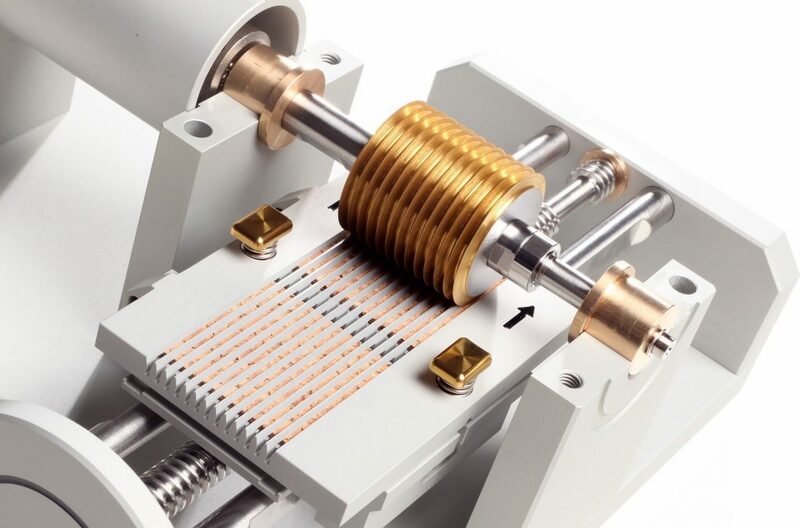 The Meek machine contains 13 parallel circular blades. The cork plate with the graft on it, is passed through the Meek machine, where the blades cut through the graft, but not through the cork. Thus the graft is cut into 14 stripes 3 mm wide. After the first pass, the cork is rotated 90° and passed through the Meek machine for the second time, thus cutting the graft into 14×14 pieces measuring 3×3 mm. Then the cork plate, with the cut graft in place, is removed from the machine. The upper (epidermal) surface of the graft is sprayed with an adhesive spray and allowed to dry and become tacky. 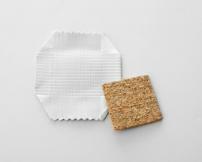 The cork plate, covered with graft and adhesive is then pressed onto a pre-folded gauze (Plissee). 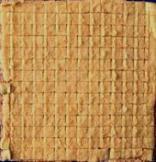 This gauze is folded on a backing into 14×14 square pleats that correspond to the cuts in the autograft. The cork is gently removed, leaving the graft islands adhering to the gauze. The gauze is pulled out by firm traction on all four sides, until the pleats become completely unfolded. Finally the backing is peeled off, to leave the expanded gauze with the separated adherent autograft islands ready for transplantation. After trimming the margins, the gauze is applied, graft side down, to the wound bed and secured with surgical staples. After about 6 days the grafts have grown sufficiently into the wound bed to allow removal of the gauze, leaving the autograft islands in situ on the wound. Daily dressings are continued until epithelialization is complete. 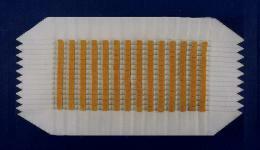 The cutting machine contains 13 circular blades that cut the graft into 196 square pieces, measuring 3×3 mm. The graft and cork plate are placed in a cutting block that moves under a bridge during cutting. The drive of the blades is performed by pneumatic motor. The pneumatic drive is a pressure of 5-7 bars. The blades are coated with a durable, wear resistant ceramic layer. 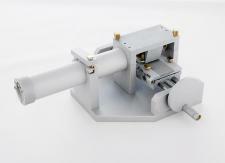 The cutting axis can simply be replaced and is available as an extra spare part. The machine is supplied with a single, or a double cutting block. The double cutting block enables simultaneous cutting of two cork plates, thus saving time in the MEEK procedure. Single and double blocks are exchangeable, using the same machine. The machine is entirely washed and steam sterilized before use, except for the motor. From the experiences of surgeons in the last 20 years, we listed the most important recommendations when doing surgery with the MEEK technique. Reading them carefully will prevent unnecessary failure. Prior to the first use, please take close look at the instruction film supplied with the equipment. Don’t put any oil or other fatty substance on the patients skin when harvesting the graft. This prevents the glue from sticking the graft to the gauze. Use saline solution instead. Don’t harvest a graft so thick that fatty tissue is visible at the dermal side. Such fatty tissue will cause the graft to slip on the cork plate at cutting. Normally the MEEK technique is used for split thickness grafts (thickness approx. 0.3 mm). Check before use whether or not the screws of the bridge are fixed (by hand). Use pressure air to drive the motor (pressure 4-7 bars). When activating the motor with the foot pedal, always press the foot pedal completely. Don’t try to throttle the airflow by pressing it partly as this will cause air leakage. Before use, briefly immerse the cork plate in saline solution. Place the graft on the cork plate dermal side down. Alternatively place the graft on a cutting board epidermal side down and subsequently place the cork plate on top of it. Whichever technique used the dermal side of the graft should face the cork plate. Don’t let the graft overlap the cork plate. The size of the graft should be the same as the size of cork plate (42×42 mm) or just slightly smaller. You can use the cutting aid (“stamp”) to be sure the graft is the correct size (41×41 mm). Moisten the underside of the cover (the grating) of the cutting block before closing it to prevent the graft from sticking to the cover when opening. However, if the graft sticks to the cover use the “cam” to press it back to the cork plate before opening the cover. Always place the cutting block in the machine at the side of the hand wheel and then move it towards the other side, not the other way round. Don’t spray too much glue on the graft. After spraying the graft should appear glossy. No “pool” of glue should be seen. Spray from a distance of about 20 cm and keep the spray moving over the surface of the graft. Allow the glue to dry for at the very least 8 minutes before pressing the cork plate with the graft onto the pre-folded gauze. Longer drying times will not harm. Remove the cork plate from the prefolded gauze only immediately before transplantation to prevent the graft from drying. If transplantation is delayed, keep the cork plate on the gauze or wrap the prefolded gauzes in moistened dressings. You can also unfold the gauzes and put them into saline solution until the moment of transplantation. At transplantation, fix the gauze with the graft islands firmly onto the wound bed with staples. This is to prevent the gauze from moving during dressing changes. Also stretch the fabric (all pleats completely unfolded) before stapling it for good contact between grafts and wound bed. Don’t place the cutting axis blades onto a hard surface (table). You will damage the blades. After use you can take out the axis from the machine and clean the blades with a soft brush. Put the axis back in the machine for washing and sterilization. During transport the cutting block should be under the bridge to prevent it from falling from the machine when turned upside down. MEEK case by Dr. A.W.F.P. Vloemans, Surgeon at the Burns Centre of Red Cross Hospital Beverwijk, The Netherlands. MEEK case by Prof. Ognian Hadjiiski, MD, Pirogov Emergency Medical Institute, Sofia, Bulgaria. MEEK Technique requires half donor site are compared to meshing. A publication in Burns by R. Peeters and A. Hubens. Burns vol. 36, pp e10-e20 (2010). 27 Seema Menon a, Zhe Li b, John G. Harvey a, Andrew J.A. Holland, The use of the Meek technique in conjunction with cultured epithelial autograft in the management of major paediatric burns — Burns vol. 39, pp 674-679 (2013).